“It’s strange what you remember, what will keep,” Sara Majka’s protagonist says in “Reverón’s Dolls,” the opening piece in Cities I’ve Never Lived In, and thus she introduces the core question of her debut collection: if memory deteriorates and transforms as time passes, how can it be trusted? Sara Majka’s stories largely follow an uprooted woman turned traveler who navigates through small towns and sprawling cities in New England and beyond, seeking to understand loneliness, wanting, and the unexpected ways in which we find ourselves alone. Majka’s haunting first collection of short fiction deftly explores the ways in which people are lost, both emotionally and physically. The stories are appropriately unsentimental and unapologetic. “Saint Andrews Hotel” features an eleven-year-old boy who cuts his wrists with a coping saw, and another depicts a hopeful woman who speculates that abducted children might be more appropriately referred to as “travelers,” taken from and returned to some unknown place. In the title story, the narrator travels from city to city visiting soup kitchens, and as she puts it, she carries with her a “desire for the kind of love you’re supposed to have once you’re no longer someone’s child.” Ultimately she’s seeking a connection, something that links her to the world―and to the people in it―in a real and meaningful way. This is also the case in the opening story, “Reverón’s Dolls,” in which the narrator suffers the painful fallout of divorce, but afterward finds she falls in love too easily. As Majka explores her characters’ desires for connection, the reader begins to see the human condition as the characters do: as a perpetual state of longing. Perhaps that’s to be expected when navigating memory, as our wants and desires inevitably stem from experience. The characters want in ways that readers may find familiar: sometimes without knowing from where the feeling comes, as is the case in “Travelers”; sometimes accompanied by physical longing, the kind that pulls us and fills us with urgency. The characters also wrestle with what might be considered the most damaging type of wanting, that which can never be satiated. They hunger for those things that rest out of their reach: loves that are undeniably lost, runaway fathers and abducted children, and something to fill the quiet hollowness that seems to settle deep within after they’ve given too many pieces of themselves away. Many of the fourteen stories are told by the same smooth-talking narrator, who gets away with saying things like “the lover I had left behind in New York had stopped calling.” She arrests you in conversation, stories running together so seamlessly that she can begin one with: “Or another Portland story,” and you won’t bat an eye. You know her; you have for some time. You look forward to talking with her again. She proves to be somewhat unreliable, as Majka plays with the concept of memory in most, if not all, of the stories in the collection. Once the narrator recalls a therapy session, in which she realizes she has no firsthand memories. She explains: “All of my memories were remembered memories.” But is this not the way we remember everything? For the narrator, no. She clarifies that these memories have merely become stories she knows because she’s told them so many times. The same narrator later sees another therapist, one who fabricates reality, and therefore fabricates memories: “[S]he always got my appointments mixed up and made me wait in the hall and then filled out incorrect times on my form to make my wait appear shorter.” These stories point to the idea that reality is a subjective construction, effectively blurring the line between the real and the imagined. Majka reminds readers that memory is unique to an individual, even if an experience is shared. Two people who share one moment often remember it differently, and when those people compare a shared memory, the memory comes out, as Majka so beautifully describes it, like “two films played over each other.” Majka asks the reader how these characters (or any of us, for that matter) can truly share experiences, if no two remembered experiences are alike. Are we then alone in every moment? Though memories isolate them as they move through the world, Majka’s narrators aren’t completely alone. They appear to be haunted by copies of themselves, and alert us to the presence of body doubles and doppelgängers—as in the title story, when the narrator visits a bookstore in Detroit: “[W]hen I walked in, the woman behind the register had said, Oh, you’ve been here before. When I said it was my first time in Detroit, she said, There’s someone who looks just like you then.” For readers, this idea of a duplicate conjures thoughts of other versions of ourselves, other paths. Majka goes a step further and creates worlds within worlds, mirror images of entire places. In “Boy with Finch,” the narrator sees an image of a building reflected in a puddle and muses: “[O]ne couldn’t look at a building in a puddle and not know that it existed, that all of life existed there, only a different life. Where did the second life go, if not further? If there were people inside the building when it was reflected, weren’t they reflected as well?” This transports the reader somewhere deeper within the narrative, to a place left intentionally nebulous. An abstracted description leaves the reader to imagine the place that might have been. For all of the sadness—the tales of abducted children and of fathers abandoning daughters—Majka skillfully refrains from slipping into the world of the melodramatic. She never even toes the knife-edge of it. It would be easy to tip the scale in a narrative like that of “Maureen,” in which a woman’s child is killed in a car accident while her father is driving under the influence. Majka takes this seemingly familiar tale and turns it into something spooky—the woman finds a child who looks exactly like her own playing with other children on the town green. This is Majka’s true magic: she has a keen way of making the ordinary otherworldly. Majka is adept at conveying the loneliness of the human experience and breathing life into the terrible, broken places and people we leave in our wake. Perhaps more importantly, though, she invites readers to reflect on how broken we ourselves can become as we move through the world. 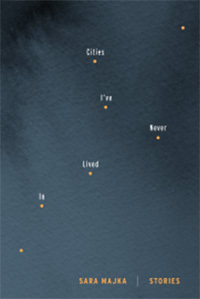 Cities I’ve Never Lived In is an unsettling but undeniably hopeful collection, and a beautiful debut. Sara Majka is the author of the short story collection Cities I’ve Never Lived In (Graywolf Press, 2016). Her work has appeared or is forthcoming in Virginia Quarterly Review, Guernica, Los Angeles Review of Books, and elsewhere.